Black Square Bumper Pad: One inch square large bumper pad and only 3/16 inch thick. Self adhesive rubber feet can be used on many surfaces to prevent scratching and to provide a non-slip grip. The one inch square bumper is ideal for cutting board feet where no slipping is important. Bumper pads are easy to install. The surface you are applying the bumper to should be smooth, non-porous, clean, dry and free of debris, oils and solvents. Wipe the surface with an alcohol pad, grasp the bumper on the sides without touching the strong adhesive. Press bumper firmly into place on the surface of your item. Bumper cannot be repositioned without ruining the adhesive. 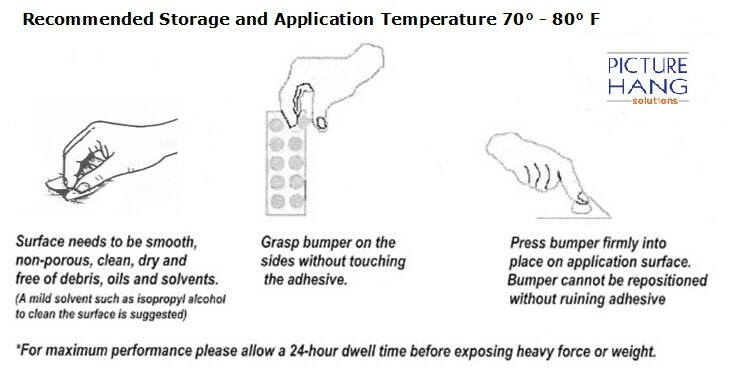 For maximum adhesion allow 24 hours before exposing heavy force or weight on the bumpers.